Editor's note: The torque ratings for the Kona's 1.6- and 2.0-litre engines were misstated in an earlier version of this story. GOYANG, South Korea -- Years after some of its competitors entered the ultra-hot subcompact crossover segment, Hyundai aims to get a slice of the action with its new Kona. Hyundai revealed the crossover Tuesday at a world premiere at the automaker's amusement parklike facility an hour northwest of Seoul. The Kona is to go on sale in Korea this month and is to hit Canada in late 2017 or early 2018. It will be the fourth crossover in Hyundai's Canadian showrooms after the Tucson, Santa Fe Sport and Santa Fe. The Kona is expected to lift Hyundai's Canadian U.S. sales, which have dropped 7.5 percent and 5.9 per cent, respectively, this year through May with a lineup dominated by cars and coupes, segments that have slumped in recent years. 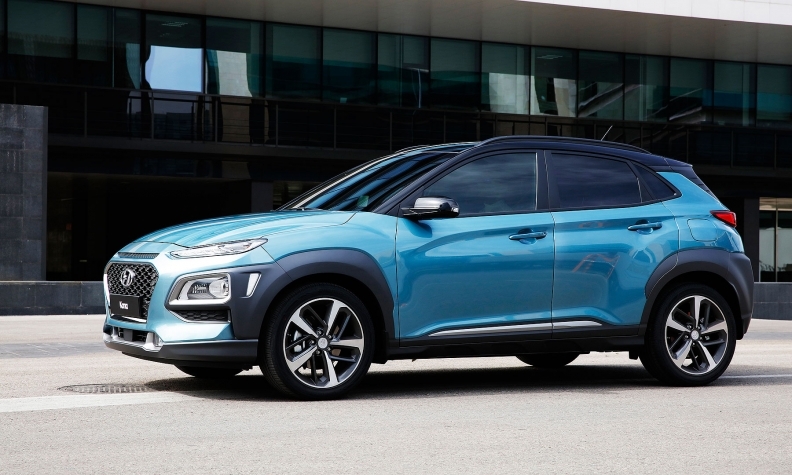 Built on the platform that also underpins Hyundai's Accent subcompact car and Kia's forthcoming Stonic subcompact crossover, the Kona also introduces a design language that departs from that of Hyundai cars and will spread through Hyundai's crossover lineup. "We aim to set new standards for the compact SUV segment, with appealing design, cutting-edge connectivity and class-leading safety features," Euisun Chung, vice chairman of Hyundai Motor Co., said in a statement before the debut. The new look that the Kona foreshadows for Hyundai crossovers is highlighted by a separation of the thin daytime running lights and turn signals at the top of the grille from the headlights tucked below them in the front bumper. This theme continues at the back of the crossover, with a pair of thin horizontal taillights high above separate turn signal housings. Plastic cladding throughout the bumpers and wheel arches gives the Kona a more outdoorsy look than what otherwise might be a decidedly downtown-oriented appearance. The design is meant to set the Kona apart from other forward-leaning models in the segment -- which includes the Nissan Juke, Toyota C-HR, Honda HR-V and Jeep Renegade -- and appeal to millennials. Inside, Hyundai is targeting best-in-class interior space with fold-flat rear seats and a high seating position. The Kona will offer two four-cylinder powertrains in Canada and the U.S., both of which are used throughout Hyundai and Kia's lineup. The base Kona gets a 2.0-litre engine that makes 147 hp and 132 pounds-feet of torque. It's paired with a six-speed automatic transmission and will go from 0 to 62 mph in 10 seconds, Hyundai said. A 1.6-litre turbocharged four-cylinder engine will be optional. It will make 175 hp and 195 pounds-feet of torque, enough for a 7.7-second 0-to-62 mph run. It's matched to a seven-speed dual-clutch transmission. Front-wheel drive will be standard with both engines, while four-wheel drive will be optional. A trio of driving modes (Normal, Sport and Eco) will also be standard. Inside, the Kona will offer tech goodies such as a 5-, 7- or 8-inch screen, Android Auto and Apple CarPlay, a head-up display, wireless smartphone charging and safety features such as pre-collision braking, lane-keep assist and blind-spot monitoring. When the Kona goes on sale in Canada and the U.S., it will join one of the fastest-growing and crucial segments in the industry. Positioned as entry-level vehicles, the bite-size crossovers are essential for automakers to lure new and younger buyers to the brand -- a role once reserved for cars of the same size. Nearly every major automaker sells a subcompact crossover, though there are some late arrivals. The Toyota C-HR went on sale in April while Ford's EcoSport isn't due to arrive stateside until early 2018.